How can artwork be hung on a wall? What magnets will work? What magnets will be strong enough to hold artwork up? How many are needed? The rest of this article assumes you have a wall made of drywall material, or some other non-metallic, non-ferromagnetic material. If you have a steel wall, your problem is much easier. Magnets stick to it -- you just need to know how strong of a magnet you need for the job. Check out our article about How Much Will a Magnet Hold for more discussion. The first case we'll consider looks much like the sketch shown at right, Situation A. 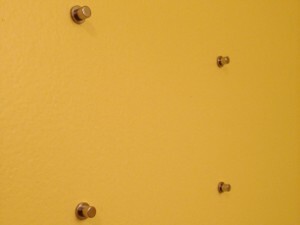 One or more countersunk magnets are secured to the wall with screws, and corresponding magnets are attached to the item being hung (not shown). 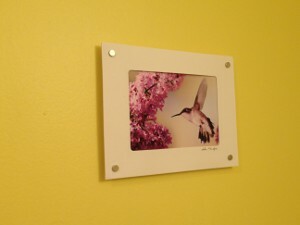 Maybe you are hanging a wood frame with magnets screwed to the back. 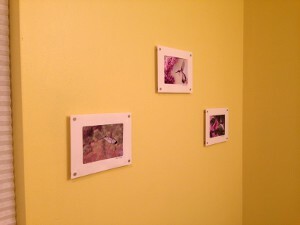 Or, perhaps you are hanging other items, like the ones shown in our recent contest winner. The item has some known weight, and you need to know how many and what size magnets to use. Remember that you need to use matched pairs for this setup. The polarity of the magnets should be opposite. Order one North version (a R822CS-N) and one south version (a R822CS-S). Or, these magnets are also sold in pairs (a R822CS-P). The way we test for our listed Pull Force Case 1 isn't quite applicable here. That listed test force would be useful if you were sticking objects to the ceiling, not a vertical wall. To get some numbers to try and describe the performance of these magnets when used this way, we tested and collected experimental data. 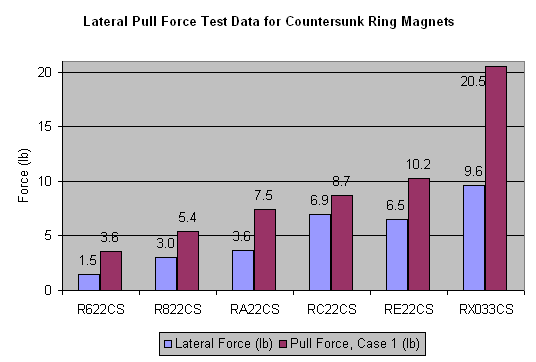 In the chart below, test data is shown for some of our popular Countersunk Magnets. These ring magnets range from 3/8" to 1" in diameter, all with a countersunk hole for easy attachment with a flathead screw. It seems that a magnet loaded in this way can hold roughly half the listed Pull Force Case 1. Note that this data can vary quite a bit. The hold relies more on the friction between the magnets than the magnetic attraction. They might hold less if coated with greasy fingerprints. They might hold more if you add friction. Plan conservatively and test magnets in your exact situation. We receive many emails about this method. It is a great way to display artwork without having to damage, poke holes into, or otherwise mangle the piece. 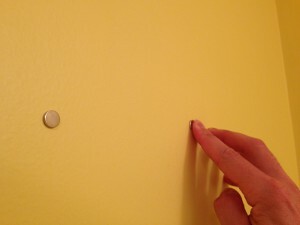 Again, a countersunk magnet is attached to a wall with a simple flathead screw. In this case, however, the artwork lays on top of that magnet, while a second magnet is placed on top. The attracting magnets sandwich the paper, holding it in place. In our test data shown below, we find that this case holds less weight than situation A above. 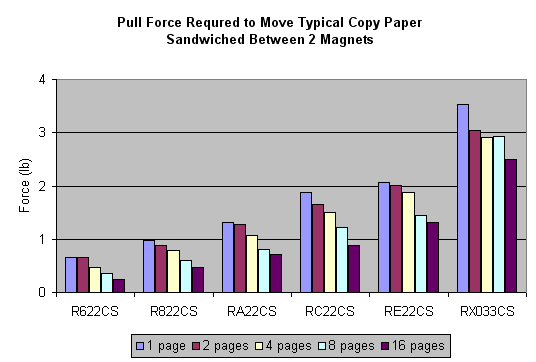 This makes sense, because this setup relies even more on the friction between the smooth magnets and the paper. Of course, paper doesn't weigh all that much. Unless your paper is very heavy cardstock, or has a large amount of paint/glue/stuff attached to it, you might not have to worry too much about how many pounds it weighs. In most cases, using enough magnets so that the corners or edges don't flop or wave in the breeze is what decides the number of magnets required. 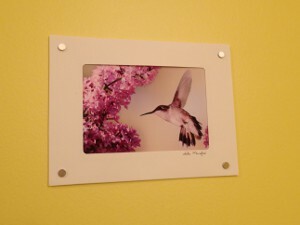 For a simple 8" x 10" print, you might just use four small magnets at the corners. For a huge 8 foot wide poster, you'll have to space several magnets across the length of it to keep it from bowing out from the wall. It all depends on the size and sturdiness of the artwork being hung. Again, our experimental test data is shown below in the graph. For each magnet, we placed different numbers of pages to determine the effect of artwork thickness on the hold. The thicker the paper, the weaker the hold. What if a magnet is attached to a nail or screw? Use screws or nails with a big head. The more steel there is for the magnet to attract to, the stronger the hold. Use steel screws. Some types of stainless steel screws aren't attractive to magnets. 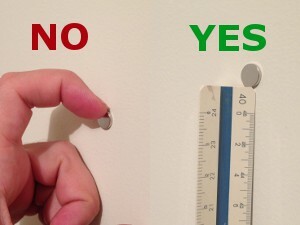 Choose a magnet that has a diameter about the same size as the screw head. Larger magnets won't provide any more holding strength. If you can screw a piece of steel to the wall, this can provide a great location to secure several magnets. In some cases, a long strip of steel is used to provide a place to secure many items. Unless the steel pieces are very thin, you can see forces similar to situation A above. Some folks like to attach washers to the wall, with magnets sticking to the steel washers. While inexpensive, you will see less holding strength from washers than the 2-magnet setup described in Situation A above. Results vary, so try it out and see. One teacher wrote to us about hot-gluing magnets to classroom walls. It's a good solution for when you can't modify the cinder-block walls in a school. Finally, if you can find a way to use some sort of lip in the mounting arrangment that the weight of the object can rest on, you can greatly improve the holding strength. 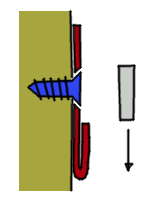 In situation E, shown in the diagram below on the right, a magnet would sit above a ledge formed in the steel sheet-metal. The magnet would bump into this ledge, stopping it from sliding down. In this case, the mounting arrangement can be much stronger, since you aren't depending on friction. For situations where there isn't anything magnetic about the wall, or if it is not possible to drive screws into the wall, our adhesive backed magnets are a great solution. We only stock them in two sizes: the 3/8" diameter D61AD-P and the D81AD-P. Stick and press the adhesive backed magnet to the drywall. The picture is sandwiched between magnets, holding it up with a neat, flat look. In this first example, a D61AD-P adhesive backed magnet is adhered to an ordinary, painted drywall interior wall. We put up four of these magnets, one for each corner of a photo. Now set the photo on top of the magnets, and then add D61 disc magnets on top of the photo. The attraction of the magnet sandwiches the photo in place, providing a great hold. These magnets won't hold a large weight this way, but thin photos or prints are easily held. Stack a cylinder magnet on top of the disc magnet for added height, which will hold the photo some distance away from the wall. The picture is held away from the wall, producing a nice shadow effect. In this second example, the same D61AD-P adhesive backed magnets are adhered to the wall. To provide a standoff effect, a taller magnet is stuck to the first. In this case, we used a 1/4" tall D44 magnet. Then, the photo is placed on top of that. Smaller D41 magnets were enough to hold the photo in place in this example. This sort of arrangement makes for a neat, drop-shadow look that's popular in art galleries. To remove from the wall, use a vertical motion. To remove the magnets, we found that a sharp tap parallel to the wall was enough to remove it. That is, tap the magnet off either straight up or down. Use a plastic ruler or other hard plastic edge. Try not to pull the magnet straight away from the wall to avoid tearing the drywall or paint.